A long-wave trough sitting over the eastern Atlantic sea, while another deep trough/low rotates over northern Scandinavia. 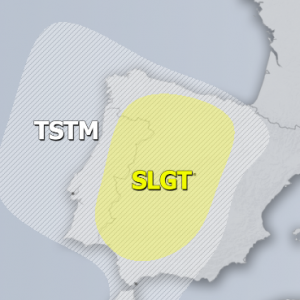 A SLGT risk has been issued for SSE France into northern Mediterranean and parts of NW Italy with threat for heavy convective rain, a few tornadoes, large hail and severe winds. The Ligurian sea will be closely monitored for upgrade into MDT risk on DAY 1 given the favourable conditions for serious flash floods and tornado threat developing. A SLGT risk has been issued for parts of NW Russia with threat for strong to severe non-convective winds. 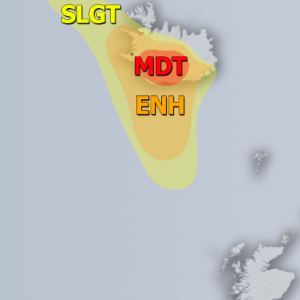 A TSTM+ risk has been issued for parts of southern UK towards Benelux and surroundings. Area will be monitored for possible upgrade into SLGT on DAY 1 as some uncertainities exist and risk level is not waranted attm. Some threat for a waterspouts and heavy rain still exist over eastern Black sea.